Three more killer shows coming up for us! • Oct 1 (The High Note — Birmingham, AL) w/Straight Line Stitch! w/Revelation Symphony, Master Key and Sinema. Presented by Flyunder Entertainment. • OCt 24 (The Masquerade — Atlanta GA) w/OTEP, Stolen Babies, New Year’s Day, and Lydia Can’t Breathe. Tickets available now! • Oct 31 — TBA (Birmingham, AL)…. Oh, we can’t wait to tell you about this one once we get the details! Spread the love, and spread the Inviolation! We’ll have more details soon! October is shaping up to be a great month for us! 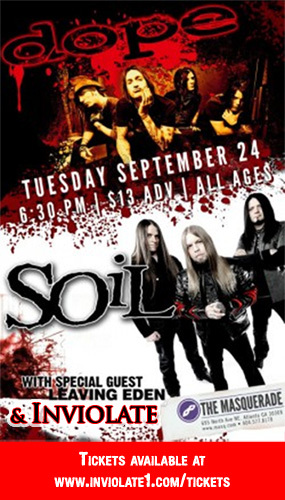 Totally stoked to be opening for SOiL and Dope on September 24th at the Masquerade in Atlanta! Tickets are available here at http://inviolate1.com/tickets (just click the flyer!) for just $13. This just happens to be the day of Kadria’s birthday, so it’s gonna be a killer time, even if it’s on a Tuesday! We’re also going back to Columbia SC to throw down with our good friends in Decadence, Right to Fall and Robot Plant at New Brookland Tavern on September 27th. That one’s only $5 for 21+. Really excited to come back to our “second home” of South Carolina, as we haven’t Inviolated the state since March. 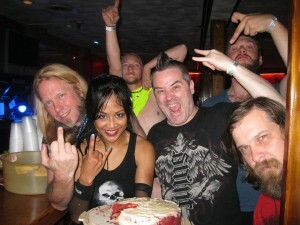 We always have a rockin’ time up there, and the Decadence and RTF guys always show us the best of Southern hospitality. We’ve also got a few radio interviews and promo spots lining up during the second half of the month, so be sure to keep an eye out on our Facebook and Twitter pages for where and when you can read and hear us. Also, all you prog metal fans might catch a glimpse of our resident metal bellydancer during Prog Power XIV at Center Stage in Atlanta during Sept 4-7. Don’t be shy, ask for a pic then tweet it/post it on Instagram and Facebook and let us know about it. Spread the word, and spread the Inviolation! Whew! Didn’t mean to neglect y’all, but time’s fun when you’re having flies, as Kermit the Frog says! I’ve been deep in the studio prepping remixes for our shows in Tampa and Orlando on Aug 16 & 17, and boy this is going to be a killer weekend of shows if you haven’t experienced one of our industrial sets yet! Historically we’ve done only one a year where Inviolate performs extended versions and remixes of some of our songs. This year we’re amping it up even more with never-before heard versions of Condemned, Feast of Ashes, and Skeptic, as well as others, plus a new sword dance. Given the reception that “Cherev” got when Kadria performed it in Orlando last June, we think that scimitar is going to have more appearances in many more shows to come. With Human Factors Lab, Ten Cent Toys, and more! Check out the Facebook link here. Haven Fest 2013! Straight Line Stitch headlining. With Traverser, F.I.L.T.H, Nuera, Human Factors Lab, Almost Winter, Halo Violation, & Stand Well Among Giants. With Dog Head and Intoxicated Logic. About to start rehearsals for our appearance at the GA Music Awards Rock/Metal showcase at the Masquerade on 5/31! They’ve saved the best for last 😉 and we only have 20 minutes to show our stuff at 1 AM, so we’re still gonna bring it as the finale to a killer night of local rock and metal. 2.0 Lineup is: Alan Strange (guitar), Robert Hannon (bass), and WuD on Drums on… well, you get the picture. This was one of the lineups for our CD release party last year, so everyone’s in the pocket and ready to rock. See y’all there! Well, that went well! Due to Jarrod having to bow out of this gig, we had to re-configure our show (and backing tracks) to be a 3-piece for the Knoxville, TN show at 90 Proof. And according to everyone we talked to, they loved it! Some people were also wondering how Robert was playing bass and guitar simultaneously (wink wink). Well, the folks we work with are just THAT good. And, Deconbrio’s representative “Merk” and Kadria had their dance-off re-match…. video should hopefully be forthcoming. Red velvet cheesecake, courtesy of Belfast 6 Pack’s guitarist Anthony “Gun” Gunter, and a stormy drive back to Atlanta topped it off — wow. Great end to our first tour! Can’t wait to do it again! About to go on the road…. Yup. `Tis the night before tour, and all through the house, `twas a chaos of cables, coin sash and blouse.